Japanese Tea Flavoured Ice Cream, a photo by timtak on Flickr. 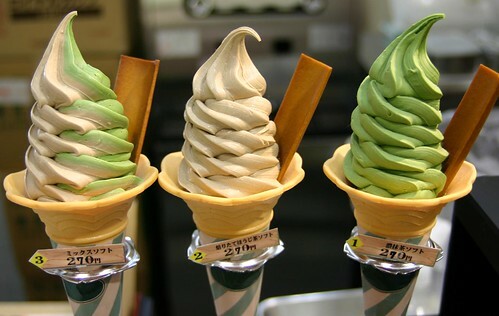 A set of model plastic Japanese ice cream in buckwheat (soba) and green tea (maccha) flavours. Japanese like to see the food their are ordering before ordering it. The brown things stuck into the ice cream are not chocolate flake but traditional Japanese biscuits. That the Japanese eat buckwheat and green tea flavoured ice-cream is less surprising than the fact that they are so good at copying things. I take the liberty of writing about Japanese "authenticopies" again since the above is my most popular photograph. The culture of copying things in Japan is sufficiently widespread and revered as to have received academic attention (Cox, 2007). The Japanese copy everything from mirrors, horses, and cars, to foreign villages and especially food. While no one will attempt to eat these plastic ice cream cornets, they are seen as being delicious: sufficiently identical to the real thing as to arouse desire. Copies of things are given as offerings to Japanese deities at shrines where they are seen as sufficiently identical to sate desire. I think that the practice can be understood by reference to the way in which Westerners believe in the copying power of the sign (Derrida, 2011). Words are thought to create a copy in the mind of their recipients of the meaning of the their sender. I have an idea and translate it into the "signified" the word "sender" for instance, and you read it and recreate an identical copy of the idea that I had in my mind. If I did not believe in this identical copies - these words that arise in my mind and yours - then I would be faced with an identity crisis since one of the ideas, the one corresponding to the phoneme "I" spoken to myself, is myself (Benveniste, 1971). But how is it that you, dear reader, can understand my words in the same way as I do? The ability for humans to believe in the transference of meaning in this way, for meanings to be objective is due to their belief in God, or a simulation of the same. Gods too can be simulated (Baudrillard, 1995). Words "exist in", or are pegged to their understanding - a sort of gold standard - in the mind of an intra-psychic third party: someone that is always listening. As we speak to real others, we believe that we also speak to an impartial spectator (Adam Smith, 1812), a generalised other (Mead, 1967), an Other (Lacan, 2007), superego (Freud, 1913) or superaddressee (Bakhtin, 1986): all these are either words for a sort of imaginary friend or a deity (see Marková, 2006, for a downloadable review). By this device, since words are always public, as well as being in our heads we believe in their identical copy-ability. In Japan the gods look rather than listen. The visual world is always shared. The visual world in Japan, which relegated to the nether land, a "mere image" or "veil" in the West, has the same properties as the Western sign: it is both in the world and in the head. The world and mind meet at the plane of the mirror that is seen with Japanese deities, especially the sun-goddess, who is that mirror itself. We think nothing of copying signs. The Japanese think nothing of copying food. Benveniste, E. (1971). Problems in General Linguistics. (M. E. Meek, Trans.) (Vol. 3). University of Miami Press Coral Gables, FL. Marková, I. (2006). On the inner alter in dialogue. International Journal for Dialogical Science, 1(1), 125–147. This sounds great! My friend went to Japan and brought me back tea flavored oreos (they weren't even round! BUt they said oreo and everything! ).